Unused. 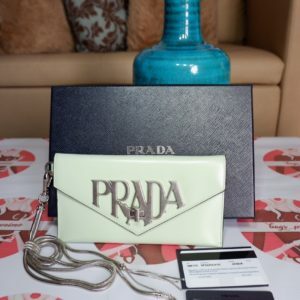 Authentic Prada 1M1183 Tessuto Quiltin Ibisco Wallet. Excellent condition. Authentic Prada Saffiano 1M0506 Rame Zippy Wallet. Excellent condition. Authentic Prada Saffiano M510A Black Wallet. Brand new. Authentic Prada Tessuto 1ML506 Black Zippy Wallet. Comes with authenticity card and box.